At Hylan Daycare, Inc., our mission is to offer every child with a quality and unforgettable early childhood learning experience. Our focus is to provide a nurturing, safe, stimulating and developmentally appropriate environment centered on each child’s individual needs. We believe that stimulating our children’s young minds to think critically and solve problems through play-based and aesthetic activities will inspire them to use their intuition, imagination and creativity toward understanding something as a whole. Composing the musical tale of a lively childhood adventure is what we strive to paint your child’s day, everyday. Hylan Daycare, Inc. is staffed with early childhood education specialists, teachers, and child caregivers who have a deep understanding of the child’s mentality and at the same time open-minded to the dynamic changes that take place while the young brain undergoes rapid development during the early years of life. 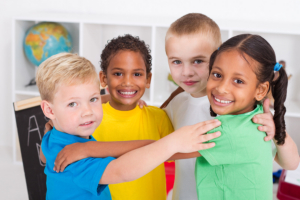 We are an independently-run and locally owned day care center, licensed by the New York City Department of Health and Mental Hygiene and highly compliant with the statutory and national standards for quality child care. Hylan Daycare, Inc. is a child-friendly day care center. We use positive discipline in cultivating desirable behavior,genuine praises, and continuous motivation. On top of that, our staff are fully-mandated reporters by the state of NY, which means we are entitled and are given the lawful right to report to the authorized officials any incidences or child report of abuse, injurious punishment, or coercive treatment. Parents are very much welcome to come visit us at the center and support your child’s little endeavors with your comforting presence. We have an open-door policy so your child’s daily adventures become yours as well. Seeking to establish a healthy long-term relationship with the children’s parents/guardians, you can guarantee that your opinion would always be taken into consideration in the center’s major activities/projects that would involve decision-making. Parents are our number one resource, hence we always take the time to talk to you and learn from your unique suggestions. Please visit us sometime and we would be happy to give you a tour around our center. For more information, please contact us at 718-351-2705.